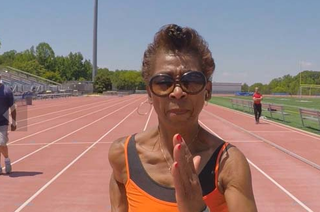 At 77, Rose Green is still brushing off her cleats and maintaining her status as one of the fastest sprinters in her age group, My Fox DC reports. It's a pretty impressive feat, not only because of her age but also because she took up the sport just last year and rose to the top of the ranks in such a short time. According to My Fox DC, Green, a resident of Prince George's County, Md., has won medals in several competitions, including the 200- and 400-meter races, and is the nation's record holder in her age group in the 60-meter sprint. Green, a great-grandmother, is trained vigorously by coach Cortez Austin. He's also her boyfriend. "She's world-class," Austin said about Green's work ethic and ability. She trains seven days a week. Green says that she doesn't get any special treatment from Austin. "He'll tell me, 'Your form is not right, you're not going as fast as you should,' " Green said. "He's a very strict coach even though we are lovers." Green is turning into a local celebrity in her Cameron Grove adult community, and she's helping students and other runners strive to greatness as well. "She is like a celebrity," said Austin. "It's no question that she is an inspiration." "I hear that so many times that I'm starting to believe that I'm an inspiration to all these people," Green said. Green is currently training for the national senior championships in July. "I'm working towards the world record," she said. "Why not?"